Raumfahrt - Fehlstart von Long March-4C-Trägerrakete mit Gaofen-10 Satelliten ? Astronomie - GENESIS Projekt: Sollten wir Geschenk dem Kosmos mit Leben geben? Astronomie - Gab es ein Alien-Funksignal von sonnenähnlichen Stern HD 164595 ? This infrared image gives an unprecedented view of the southern aurora of Jupiter, as captured by NASA's Juno spacecraft on August 27, 2016. The planet's southern aurora can hardly be seen from Earth due to our home planet's position in respect to Jupiter's south pole. Juno's unique polar orbit provides the first opportunity to observe this region of the gas-giant planet in detail. Juno's Jovian Infrared Auroral Mapper (JIRAM) camera acquired the view at wavelengths ranging from 3.3 to 3.6 microns -- the wavelengths of light emitted by excited hydrogen ions in the polar regions. The view is a mosaic of three images taken just minutes apart from each other, about four hours after the perijove pass while the spacecraft was moving away from Jupiter. NASA's Jet Propulsion Laboratory, Pasadena, California, manages the Juno mission for the principal investigator, Scott Bolton, of Southwest Research Institute in San Antonio. The Juno mission is part of the New Frontiers Program managed at NASA's Marshall Space Flight Center in Huntsville, Alabama. Lockheed Martin Space Systems, Denver, built the spacecraft. JPL is a division of Caltech in Pasadena. NASA's Juno spacecraft captured this view as it closed in on Jupiter's north pole, about two hours before closest approach on Aug. 27, 2016. Juno was about 48,000 miles (78,000 kilometers) above Jupiter's polar cloud tops when it captured this view, showing storms and weather unlike anywhere else in the solar system. 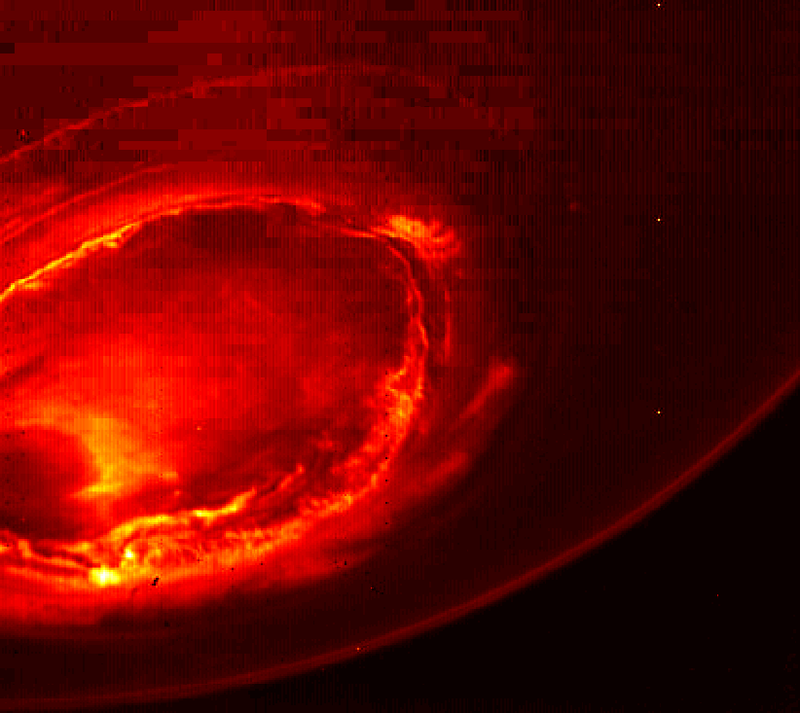 This infrared image from Juno provides an unprecedented view of Jupiter's southern aurora. Such views are not possible from Earth. NASA’s Juno spacecraft has sent back the first-ever images of Jupiter’s north pole, taken during the spacecraft’s first flyby of the planet with its instruments switched on. The images show storm systems and weather activity unlike anything previously seen on any of our solar system’s gas-giant planets. Juno successfully executed the first of 36 orbital flybys on Aug. 27 when the spacecraft came about 2,500 miles (4,200 kilometers) above Jupiter’s swirling clouds. The download of six megabytes of data collected during the six-hour transit, from above Jupiter’s north pole to below its south pole, took one-and-a-half days. While analysis of this first data collection is ongoing, some unique discoveries have already made themselves visible. One of the most notable findings of these first-ever pictures of Jupiter’s north and south poles is something that the JunoCam imager did not see. Along with JunoCam snapping pictures during the flyby, all eight of Juno’s science instruments were energized and collecting data. 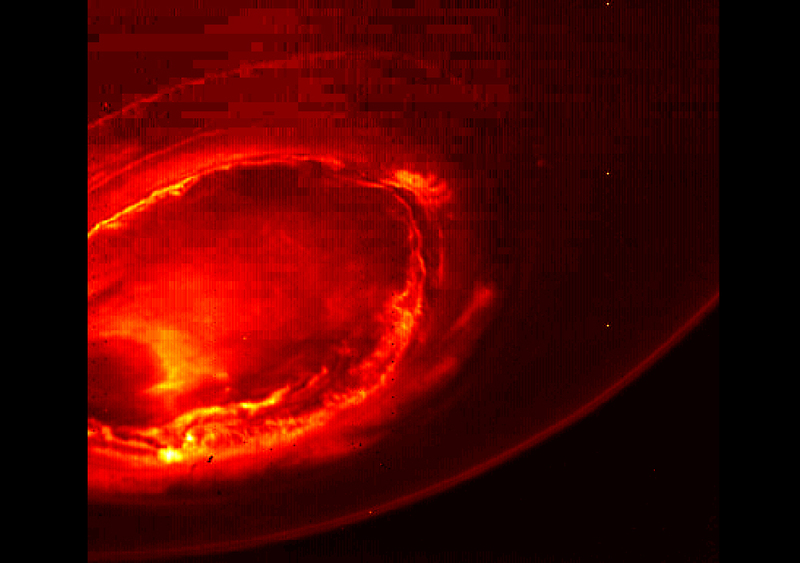 The Jovian Infrared Auroral Mapper (JIRAM), supplied by the Italian Space Agency, acquired some remarkable images of Jupiter at its north and south polar regions in infrared wavelengths. Among the more unique data sets collected by Juno during its first scientific sweep by Jupiter was that acquired by the mission’s Radio/Plasma Wave Experiment (Waves), which recorded ghostly-sounding transmissions emanating from above the planet. These radio emissions from Jupiter have been known about since the 1950s but had never been analyzed from such a close vantage point. The Juno spacecraft launched on Aug. 5, 2011, from Cape Canaveral, Florida and arrived at Jupiter on July 4, 2016. JPL manages the Juno mission for the principal investigator, Scott Bolton, of Southwest Research Institute in San Antonio. Juno is part of NASA's New Frontiers Program, which is managed at NASA's Marshall Space Flight Center in Huntsville, Alabama, for NASA's Science Mission Directorate. Lockheed Martin Space Systems, Denver, built the spacecraft. Caltech in Pasadena, California, manages JPL for NASA. Thirteen hours of radio emissions from Jupiter's intense auroras are presented here, both visually and in sound. As Juno approached Jupiter on August 27, 2016, it's Jovian Infrared Auroral Mapper (JIRAM) instrument captured the planet's glow in infrared light. This image provides a close-up view of Jupiter's southern hemisphere, as seen by NASA's Juno spacecraft on August 27, 2016. The JunoCam instrument captured this image with its red spectral filter when the spacecraft was about 23,600 miles (38,000 kilometers) above the cloud tops. The image covers an area from close to the south pole to 20 degrees south of the equator, centered on a longitude at about 140 degrees west. The transition between the banded structures near the equator and the more chaotic polar region (south of about 65 degrees south latitude) can be clearly seen. A second version of the image shows the same view with a latitude/longitude grid overlaid. 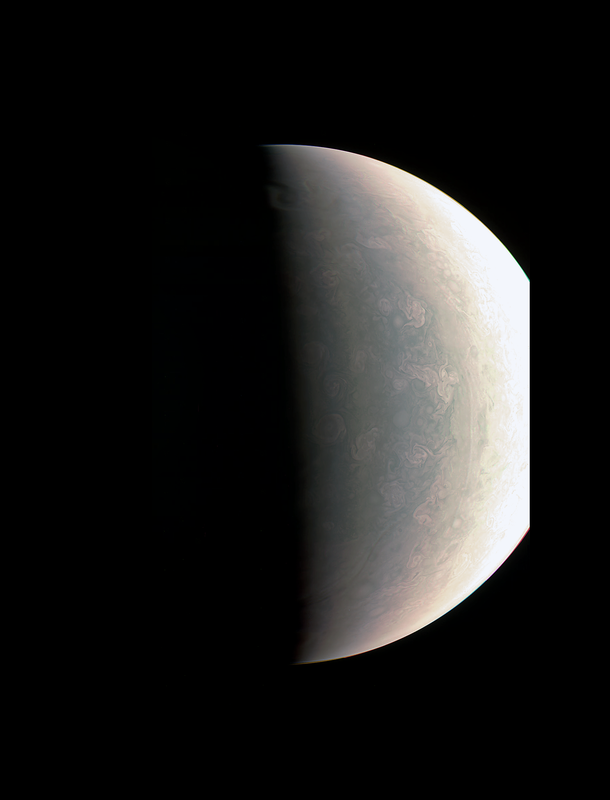 This image has been processed to remove shading effects near the terminator -- the dividing line between day and night -- caused by Juno's orbit. 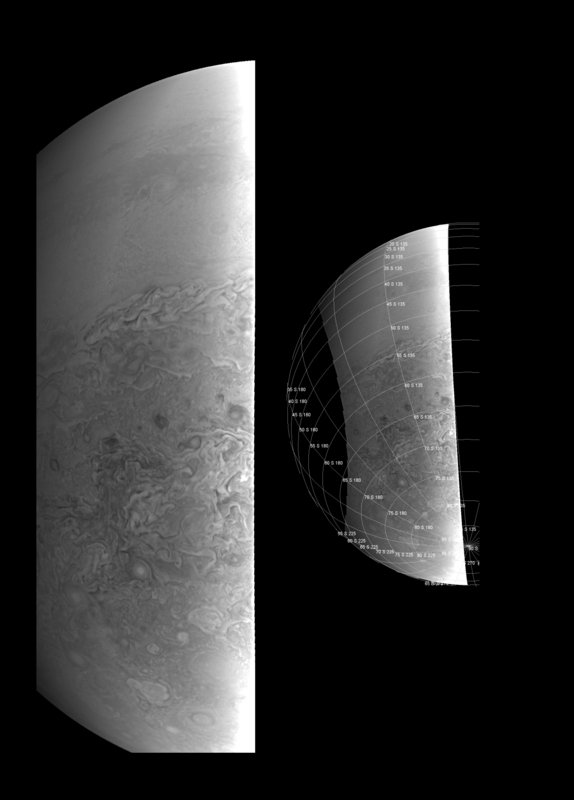 This montage of 10 JunoCam images shows Jupiter growing and shrinking in apparent size before and after NASA's Juno spacecraft made its closest approach on August 27, 2016, at 12:50 UTC. The images are spaced about 10 hours apart, one Jupiter day, so the Great Red Spot is always in roughly the same place. The small black spots visible on the planet in some of the images are shadows of the large Galilean moons. 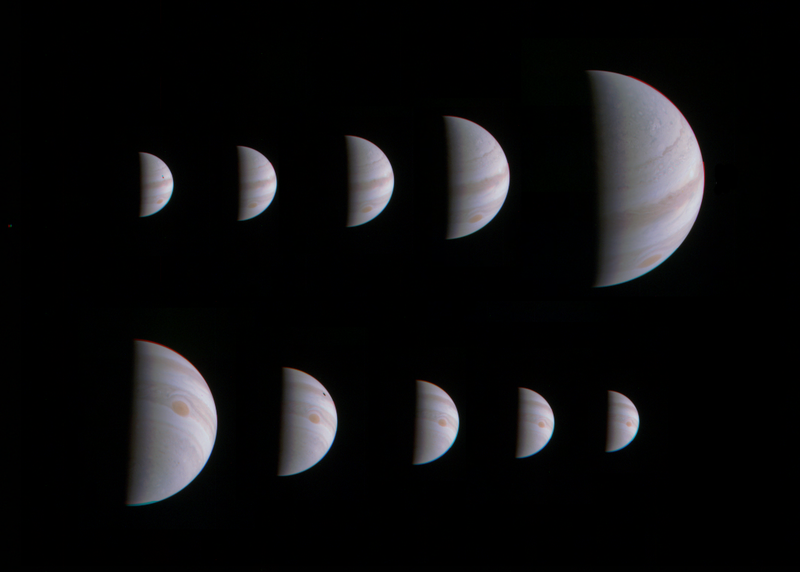 The images in the top row were taken during the inbound leg of the orbit, beginning on August 25 at 13:15 UTC when Juno was 1.4 million miles (2.3 million kilometers) away from Jupiter, and continuing to August 27 at 04:45 UTC when the spacecraft was 430,000 miles (700,000 kilometers) away. The images in the bottom row were obtained during the outbound leg of the orbit. They begin on August 28 at 00:45 UTC when Juno was 750,000 miles (920,000 kilometers) away and continue to August 29 at 16:45 UTC when the spacecraft was 1.6 million miles (2.5 million kilometers) away. This image from NASA's Juno spacecraft provides a never-before-seen perspective on Jupiter's south pole. 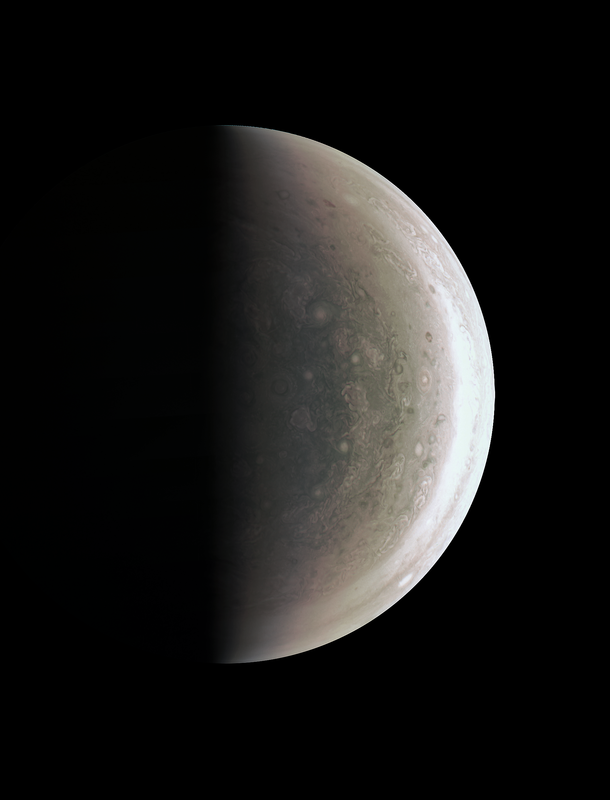 The JunoCam instrument acquired the view on August 27, 2016, when the spacecraft was about 58,700 miles (94,500 kilometers) above the polar region. At this point, the spacecraft was about an hour past its closest approach, and fine detail in the south polar region is clearly resolved. Unlike the equatorial region's familiar structure of belts and zones, the poles are mottled by clockwise and counterclockwise rotating storms of various sizes, similar to giant versions of terrestrial hurricanes. The south pole has never been seen from this viewpoint, although the Cassini spacecraft was able to observe most of the polar region at highly oblique angles as it flew past Jupiter on its way to Saturn in 2000 (see PIA07784). Storm systems and weather activity unlike anything encountered in the solar system are on view in these color images of Jupiter's north polar region from NASA's Juno spacecraft. Two versions of the image have been contrast-enhanced differently to bring out detail near the dark terminator and near the bright limb. 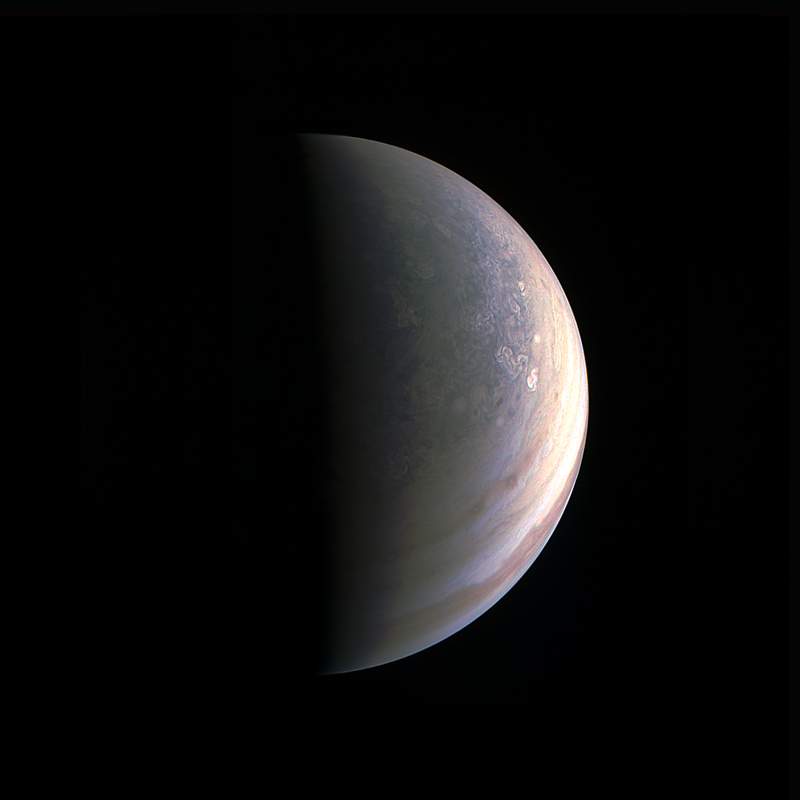 The JunoCam instrument took the images to create this color view on August 27, when the spacecraft was about 48,000 miles (78,000 kilometers) above the polar cloud tops. A wavy boundary is visible halfway between the grayish region at left (closer to the pole and the nightside shadow) and the lighter-colored area on the right. The wavy appearance of the boundary represents a Rossby wave -- a north-south meandering of a predominantly east-west flow in an atmospheric jet. This may be caused by a difference in temperature between air to the north and south of this boundary, as is often the case with such waves in Earth's atmosphere. dynamics of the Jovian atmosphere. This image also provides the first example of cloud shadowing on Jupiter: near the top of the image, a high cloud feature is seen past the normal boundary between day and night, illuminated above the cloud deck below. While subtle color differences are visible in the image, some of these are likely the result of scattered light within the JunoCam optics. Work is ongoing to characterize these effects.